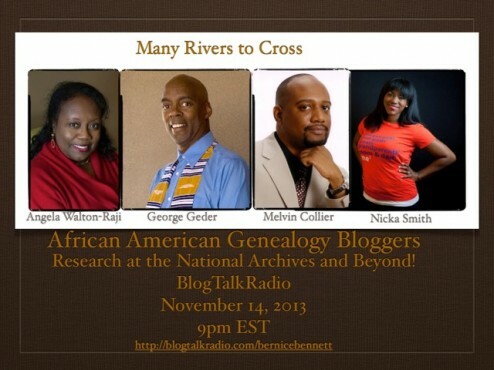 african american bloggers featured on Research at the National Archives and Beyond on Nov. 14! - who is nicka smith? african american bloggers featured on Research at the National Archives and Beyond on Nov. 14! me, George Geder, and Melvin Collier are being featured on the November 14 episode of Research at the National Archives and Beyond! blogging about many rivers to cross has been such a great experience that me, George Geder, and Melvin Collier are being featured on an upcoming episode of Research at the National Archives and Beyond. be sure to tune in at 6pm PST/8pm CST/9pm EST as Angela Walton-Raji leads a dynamic discussion of our reactions to the new PBS series by Henry Louis Gates, Jr.
Ms. Walton-Raji is an author, genealogist, producer of the weekly African Roots Podcast and prolific blogger of the Native American blog, and My Ancestors Name. Mr. Collier is a genealogist and author of 150 Years Later: Broken Ties Mended and Mississippi to Africa- A Journey of Discovery. His blog Roots Reveals examines the many ancestral discoveries based upon new DNA results. Mr. Geder is a strong advocate for having all cultures and family lifestyles being heard and represented in the genealogy community. He is also an Evangelist for the African Ancestored Genealogy. are there any questions or comments you have about our commentary thus far? anything you’d like to see us talk about in relation to genealogy that you don’t see addressed on the show? leave your answers as a comment below. see you on November 14!